Don't get stuck in the dark! 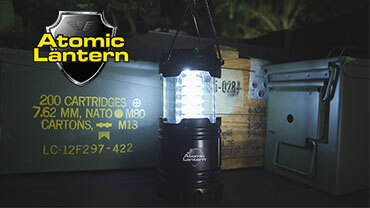 Atomic Beam® Lantern is the ultra-bright tactical lantern. READ FULL DESCRIPTION The military uses some of the most powerful lighting in the world, and now that technology is yours to use at home with Atomic Beam® Lantern! Atomic Beam® Lantern is stronger and brighter than regular flashlights. Simply pull it up to turn it on. You get 360 degrees of bright, white light. It contracts into its military-grade case so you can take it anywhere. It's the ultimate portable light! It's perfect for in the truck or on the boat, or even hunting and camping. Atomic Beam® Lantern LED's can last a lifetime without burning out. You need a light that lasts long and shines bright! You can get your Atomic Beam® Lantern today for just $19.99 and pay NO SHIPPING & HANDLING! And when you order you'll receive a FREE upgrade to the Atomic Lantern with magnetic base. As our way of saying thanks, you can get a second Atomic Beam® Lantern PLUS the Atomic Beam USA Flashlight, the ulta-bright military grade flashlight. Just pay a separate fee of $9.99.